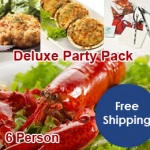 View cart “Deluxe Party Pack (6 Person)” has been added to your cart. Our Classic Surf and Turf dinner for four comes with four 5-6 oz. premium Maine lobster tails and four 6 oz. premium aged filet mignons. Our Classic Surf and Turf dinner for four comes with four 5-6 oz. premium Maine lobster tails and four 6 oz. premium aged filet mignons. Lobster tails and filets shipped right to your door!